Course Description: This course prepares journalists to write about religion for a secular audience. 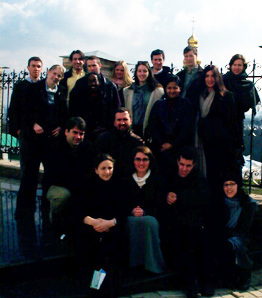 The course looks at major religions today through a case study of how religion is evolving in the former Soviet Union. During the first seven weeks of the course, the class reports on different Russian and Ukrainian religions found in the New York area through visits to churches, mosques and synagogues. Each student is required to become the class expert on a specific faith or denomination, writing articles and sharing what he or she has learned with the class. During spring break, the class takes a 10-day study tour of Russia and Ukraine. (The trip is subsidized by the Scripps Howard Foundation.) 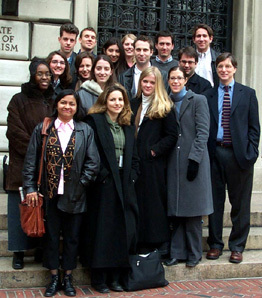 Throughout the semester, but especially during the study tour, the class maintains a web site where regular news reports and features are posted (http://www.jrn.columbia.edu/russia). Special Requirements: Full time students must complete and submit their Masters Project before spring break commences on March 14th. Students will occasionally have to work on weekends to cover religious events. B.A., Yeshiva; M.S., Columbia; New York Times Fellow, Harvard Divinity School; Visiting Fulbright Professor, Hebrew University, Jerusalem; adjunct professor, Graduate School of Arts & Sciences, Columbia. Reporter and religion correspondent, The New York Times; columnist, The International Jerusalem Post; board member, The New York Jewish Week. Director, Scripps Howard Program in Religion, Journalism and the Spiritual Life. Author, The Search for God at Harvard (1991) and Being Jewish (2000). If cursing like a sailor is the mark of a talented religion reporter, Manya Brachear is well on her way to winning a Pulitzer. Manya bounced between Texas and North Carolina for most of her life before landing at Columbia University this year. Previously, she worked as an education and religion reporter at The News & Observer in Raleigh, NC. Now she's the guinea pig for Columbia's new dual degree program in religion and journalism. Ailis Brown, 25, is a part-time student at Columbia University's Graduate School of Journalism. She also works full-time at Columbia managing the Office of Residential Programs. This May, Brown hopes to graduate from the J-School, adding a Master of Science to her Bachelor of Arts, which she received from New York University in 1999. Brown left New York City in October 2001 and now lives in Tuckahoe, NY. The youngest of eight children, Brown was born in Wyckoff, NJ. She lived there until she was 9-years-old, moved to Cape Cod, MA with her family and a year later moved to Trumbull, CT. While in high school there, Brown met her fiancé, whom she will marry this June. Nada El Sawy graduated from the University of Southern California in Los Angeles, Calif., where she received a B.A. in Communication. An Egyptian Muslim born in the United States, Nada has also spent summers and three years of her life in Egypt. She hopes to eventually work in international journalism. She is interested in international affairs, and is specializing in magazine writing at Columbia University Graduate School of Journalism. She is fluent in Arabic, and some French. Darren M. Foster grew up in Island Park, NY. He attended Fairfield University, where he graduated in 1996 with a B.S. in Biology. After college, Darren held a variety of unrelated jobs that included working as a chemist in an industrial paint factory, an assistant cameraman on independent films, waiter and house painter. Eventually he landed at Goldman, Sachs & Co., where he worked for almost three years as a Financial Analyst. He interspersed this time with trips to Asia, Latin America and Europe. Darren will receive his M.S. in Journalism from Columbia University in May 2002. Michael Gartland grew up in Co-op City in the Bronx and Pelham in Westchester, New York. His mother is Jewish and Croatian and his father is Irish Catholic. "That's probably the best explanation for my interest in this course." Michael has worked as a newspaper reporter for Courier-Life Publications and as a channel manager at the teen website Bolt.com. He also has written freelance for a number of publications, including Paper, the Manhattan Times, and Platform.net. Noah Haglund has worked as a reporter for The Cyprus Mail, an English language daily newspaper in Nicosia, Cyprus. After graduation from Columbia University's Graduate School of Journalism in May 2002, he hopes to write for a daily or weekly newspaper. Noah has studied Spanish, Russian and French. He graduated in 1998 from Reed College in Portland, Ore. Before he decided to become a journalist, he worked at a medical assistance company, where he arranged routine and emergency medical care for expatriates and travelers who became injured or ill, often in remote locations, outside their home countries. Jennifer was born in Florida and raised in Oakland, CA. She moved to New York at the age of 17 to attend Columbia, where she majored in anthropology and religion. Since graduating in May 1995, Jennifer has worked as a TV and documentary producer, community bank secretary, videographer, financial researcher, graphic designer, receptionist and, of course, intern. In between jobs (and sometimes during) she traveled obsessively, visiting more than 20 countries. She also lived in Egypt and El Salvador. Her work in documentaries led her to journalism. She is currently a student at Columbia's Graduate School of Journalism. Charnicia is a part-time student at Columbia University's Graduate School of Journalism concentrating in magazine writing and reporting. She is interested in both religion, science and health journalism. She works full-time for Reuters Health Information as an editorial coordinator and junior writer. Before school and work, however, is church, where she begins every week in praise and worship. A born-again Christian, Charnicia attends a Pentecostal church in Brooklyn. In her spare time, she likes to talk, read, watch TV, sing, eat, exercise and travel. Born and raised in Albany, N.Y., Brian graduated from St. John's College (the "great books" school) in Annapolis, Md, in 1996. He has a master's degree in philosophy from the University of Dallas and has spent the last two years pursuing a career in journalism; first, as an intern at the National Journalism Center in Washington, D.C., then, for two years, as a staff writer for the National Catholic Register. Brian enrolled in Columbia University's Graduate School of Journalism in May 2001, and hopes to someday cover politics and religion (and, if the need arises, Major League Baseball) for a large-circulation daily. Nicole Neroulias earned a bachelor's degree in communication from Cornell University in 2001, where she also worked as a features reporter and editor for The Cornell Daily Sun. She is currently earning her master's degree in print journalism at Columbia University. After she graduates in May 2002, she plans to cover religion, immigration and education issues for a newspaper or magazine. Elizabeth O'Brien grew up in Alexandria, Virginia and studied Comparative Literature at Brown University. She most recently worked as a book editor at Columbia, all the while feeling the pull of the journalism building from her office across campus. A fan of hefty Russian novels, Elizabeth is enjoying her first trip to the land of Tolstoy and Dostoevsky. Alan Rappeport, 23, of Philadelphia, Pa., graduated from Emory University with a bachelor's degree in philosophy and journalism. He has worked as an intern at Atlanta Magazine, CNN, and The Cape Times, in Cape Town, South Africa. Upon graduation from the Columbia University Graduate School of Journalism in May, Rappeport hopes to work for a newspaper. Anusha Shrivastava worked as a reporter and segment producer for Asia Business News in New Delhi, India, from 1996-1998 and for BBC World Television from 1993-1996. She has written for The Times of India and The Hindustan Times, two of India's largest English language dailies from 1988-1993. She is the co-author of a book "Comparative Government and Politics - Concepts and Emerging Trends." She has a Ph.D. in International Relations from Jawaharlal Nehru University in New Delhi. She currently writes for The Main Street Wire, Roosevelt Island's newspaper. After graduating in May 2002 from the Graduate School of Journalism at Columbia University, she hopes to write for a daily metropolitan newspaper. Nicole Still is currently the Executive Producer at TIME.com. A part-time student, she is in her first year at Columbia University's School of Journalism and will graduate in May 2003. Before working at TIME, she was a producer at FOXSports.com where she covered college sports. Prior to that, she was a reporter and producer at The Chicago Tribune. She has also contributed to TIMEOUT, the Cleveland Plain-Dealer and the Richmond Palladium-Item. The Cincinnati native graduated from Miami University of Ohio in 1998 with a B.A. in English and Political Science. She currently lives in New York City. Matt Volz is from New Orleans, Louisiana, where he was a newspaper reporter for two years. He graduated from the University of Richmond with a bachelor's degree in international studies and studied Russian language and literature in St. Petersburg, Russia. He was a Peace Corps volunteer in Lithuania and an information officer for a humanitarian aid organization in Kosovo. He is currently studying for a master's degree in journalism at Columbia University. A project of the Columbia University Graduate School of Journalism made possible by the Scripps Howard Foundation. Comments? E-mail us. Copyright © 2002 The Graduate School of Journalism at Columbia University.